Oracle is a modern and feature-full database that supports many features of an object relational database system. Oracle supports type definition, type inheritance, collection type, member function, nested table, association and aggregation relationships. In this article, I have implemented all features other than association and aggregation relationships. I have considered a database for a simple ecommerce site. The database will consist of different type of products having a bunch of attributes inherited from Products table whereas each table will have some other attributes of its own. So here I have a product object and a Clothes table that inherits the product object. Each clothe is available in multiple sizes. Further, each clothe tuple is available in multiple colors represented by a collection array in this example. For simplicity, I have included only one such table that inherits from products table where there could be other tables like Jewellery, Bags, Cosmetics and so on. Further, each product has multiple categories which is implemented by a nested category table. In our example, we charger 10% extra on the price of each product. Hence I have used a member function that returns 10% extra of the price. Product is an object, not the table, from which another object or type ClotheType is inherited. Product also contains a nested table Category so that each product row contains a reference to an instance of the table Category. Finally we create a table Clothes of the type ClotheType. ClotheType consists of two attributes: clothesize and clothecolor where clothesize is another Type and clothecolor is a collection array. 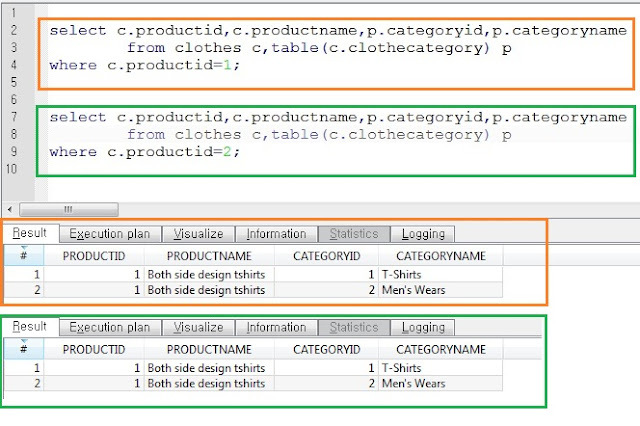 The object oriented concept of function has been included in ClotheType object which we call member function in Oracle. Now we insert rows into the Clothes table. select p.productid, p.productname,p.price,p.total_price() "Total Price"
we realized and implemented a bunch of object relational features of Oracle database. Some of the features we worked with were type inheritance, type as a column, datatype collection and nested table, as well as member function. We developed DDL script to create such objects and performed select queries. All in all, we got the good glimspe of object oriented programming in Oralce database.